Few readers will need me to recommend the Bar Zinco, a jazz joint in the centro histórico located in what used to be the basement vaults of a bank. With red velvet curtains, black walls and exposed brick, it is a little like a jazz club from an old movie, and far cooler than most such places in New York. The Zinco Big Band, composed of seventeen of Mexico City's best musicians, only plays once in a blue moon. If you are lucky enough to notice that they are doing a gig, don't think twice, just go. You're bound to enjoy their recreations of arrangements by Count Basie, Nelson Riddle, Charles Mingus and Thad Jones. Here they are on a recent night with a New York singer named J.D. Walter, who performed a couple of sets of Sinatra numbers, punctuated by his continuous remarks that he doesn't regularly sing Sinatra numbers. Walter wore an earring in each ear, a look that, combined with a shaven head, suggested the words, "stronger than dirt." The band is conducted by Eugenio Elias, the gentleman in the dinner jacket central in the above photo. The caballero with the moustache at the extreme right of the picture is Don Roberto González Barrera, who owns Maseca, the corn flour from which most of Mexico's tortillas are made, as well as Banorte, one of the country's most prominent banks. He regularly appears on the lists of staggeringly wealthy people published by Forbes magazine. According to one of the owners, he shows up at the Zinco frequently. 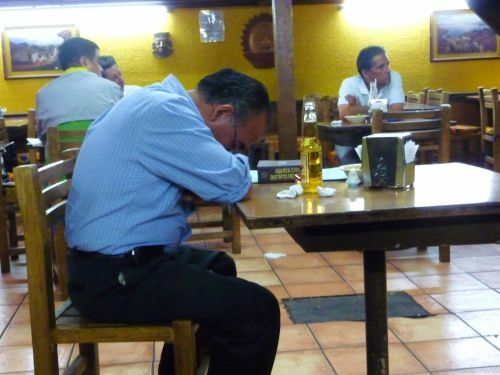 Apparently, one way that Don Roberto stays so rich is by bringing his own liquor to bars -- he and his blonde companion arrived at Zinco with a bottle of Aniversario, a Venezuelan rum that is exquisite as cognac and not so easy to find in Mexico. Sadly, they diluted that good liquor with Coca Cola. Click here to see more work by Ana Hop, the lovely and talented photographer responsible for the above photos.